I love to eat! Food is delicious and comforting and there is nothing quite like a good sandwich. If you are looking for a bite with texture, depth of flavor and picture worthiness this is the hot sandwich for you. In a hot cast iron skillet add 1 tbs vegan butter and olive oil. Sautee all the veggies until the edges are caramelized. While veggies are cooking butter the potato buns. Add garlic powder, salt, and pepper to the veggies, stir then remove veggies from heat. Place buns on the hot skillet and toast. On the bottom bun, spread Easy Peasy (Vegan) Pesto Sauce. Top with your cooked veggies. On the top bun spread hummus and add chopped olives (they will stick to the hummus). 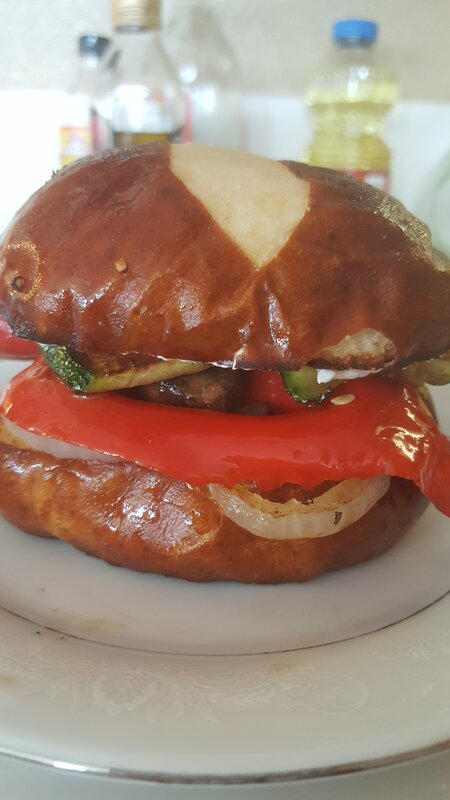 Put the top bun on the veggies and enjoy! It will be messy but worth EVERY bite. K loves this sandwich even though he is a carnivore. How do you like it?